If you like the sound of it then it’s available now in ebook and hardback. 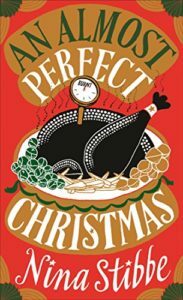 An Almost Perfect Christmas is a really pleasant read. Nina Stibbe talks about her own family Christmases in a series of essays starting with her reasons for not cooking turkey. There are also a few short stories in amongst these essays. When I was reading the stories I did sometimes forget it wasn’t the author’s own voice, so a little confusing, but altogether a nice little read. It took me around 90 minutes to read this book. At 163 pages it’s a quick read but not lacking in substance. There are seven essays, four stories and a glossary of Christmas at the back. The glossary didn’t do much for me, I must admit, but the essays in particular were great to read. My favourite story was A Present for Teacher which actually had me clapping my hand over my mouth in a kind of mixture of hilarity and horror. The book as a whole is full of the author’s dry wit and whilst I don’t particularly relate to her feelings about various aspects of Christmas, I did understand them and found them amusing to read. This has been the perfect book to read just before Christmas but I think it would also be good just after, whether or not you have had a perfect or almost perfect Christmas yourself. 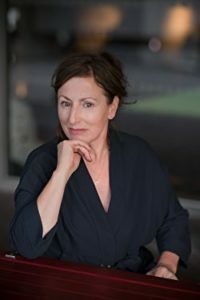 Nina Stibbe was born in Leicester. She is the author of Love, Nina, which was shortlisted for the Waterstones Book of the Year Award and won Non-Fiction Book of the Year at the 2014 National Book Awards, and the massively acclaimed novel Man at the Helm, which was shortlisted for the Bollinger Everyman Wodehouse Prize for Comic Fiction. She lives in Cornwall with her partner and two children.